Greeting fellow bakers and happy Canada Day to our Canadian friends and happy Presidents Day to my American friends! Sorry for the repetition, but this P. Reinhart recipe has become my favourite sandwich loaf. 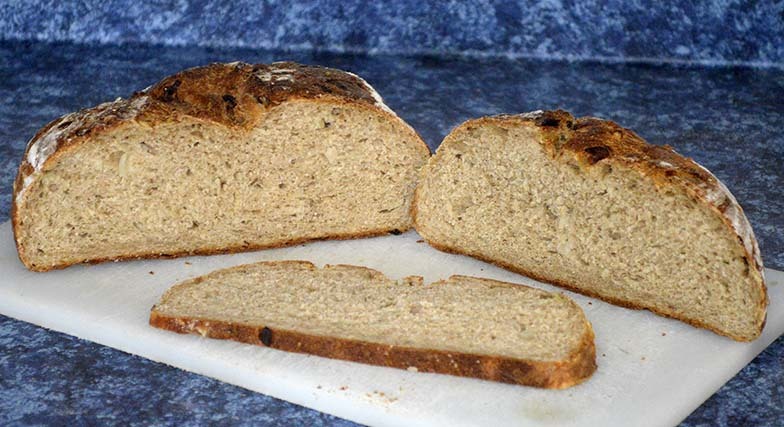 I use a whole light rye starter and it is delicious sandwich bread! I have baked this recipe in a loaf pan, free standing in the oven with the pizza stone but this time decided to try baking in a hot cast iron Dutch oven, 20 minutes covered and 20 minutes uncovered. Now Forkish style invlolves proofing in the banneton seam side down and baking seam side up. On this bake, the way the seams broke down, the finished loaf had less loft the the final proofed dough. So when I next bake this bread, I will proof seam side up and bake seam side down. I hope this change in method will give the dough more volume. It is nice baking great b read isn't it? This is much more fun. And oh-so-therapeutic! I remember now, I was going to try the pulla you posted . Soon. BTW, what if you used a smaller pot? You MUST try the pulla! Smaller pot? Yes, I was thinking that the loaf didn't gain height, but spread wide. Not a problem as the resulting loaf was fine, but it speaks to baking this recipe as a pan loaf. Then the perhaps the spread goes up. I will let you know next bake. My refrigerated rye/onion starter should be quite ripe in a week. YUMM! YES Carole, you MUST bake pulla!